I really am enjoying messing around Gephi. It’s an interesting way to look at written works. I hope we can learn how to do it because I would love to do this for other works. Anyway I had fun fiddling around with Gephi’s color system so I could better see the nodes. Not that the black isn’t cool or anything, but I just wanted to see what it could do. It was really interesting how the color system worked. And it made it easier to see everything connected with one another. I could clearly see death/writing (they were on top of each other) and greatness as one of the biggest nodes. Poetry was also a big node however I only deleted death/writing and greatness. When I deleted those three nodes I was greatly surprised with what occurred. 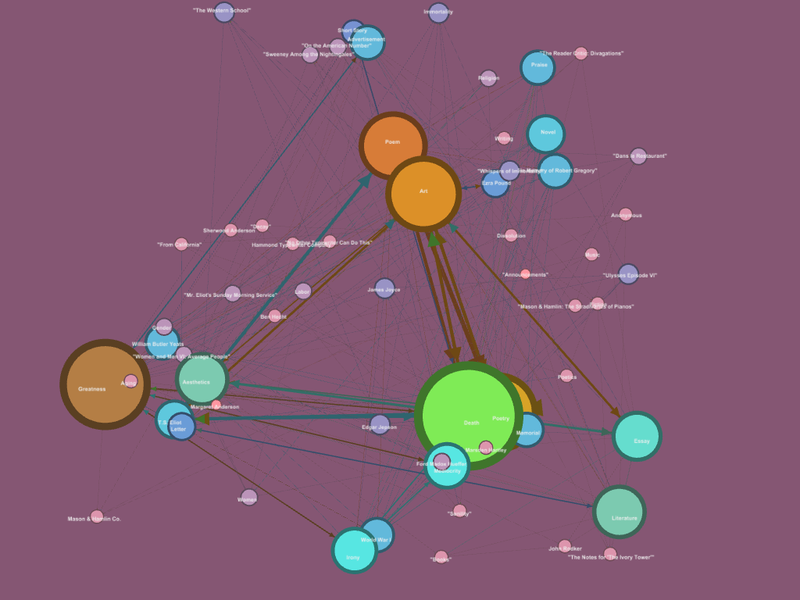 As it can be seen from the graphs the nodes deleted ended up making a triangle with Poem, poetry and T.S. Eliot. I’m not sure what this means exactly but I found it interesting that poem and poetry would connect and even more so that T.S. Eliot would connect with both. Does that mean that T.S. Eliot is primarily poetry? Or does that mean that poetry is primarily T.S. Eliot? See? It’s a confusing conundrum. Yet within this triangle everything else connects with it in some form whether directly or indirectly. So poetry is unaffected by death/writing/greatness nodes as is poem and T.S. Eliot. So does that mean that these subjects are not part of T.S. Eliot in the Little Review 1918 issue? 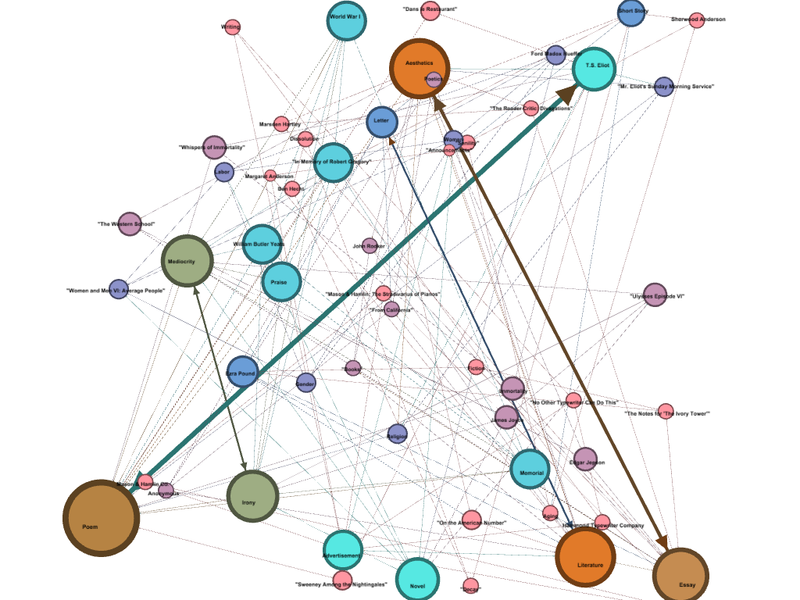 I am not sure myself but Gephi enabled me to see how things can change if you remove nodes so I then removed poetry. By removing poetry the triangle was gone and there were clear connections from poem to T.S. Eliot. I also was able to clearly see other straight forward connections like Irony to Mediocrity, Aesthetics to Literature. I found these to be the most in your face nodes after deleting poetry. Is it possible that these direct connections mean that irony is a weakness, and that literature is a form of aesthetics or vice versa? 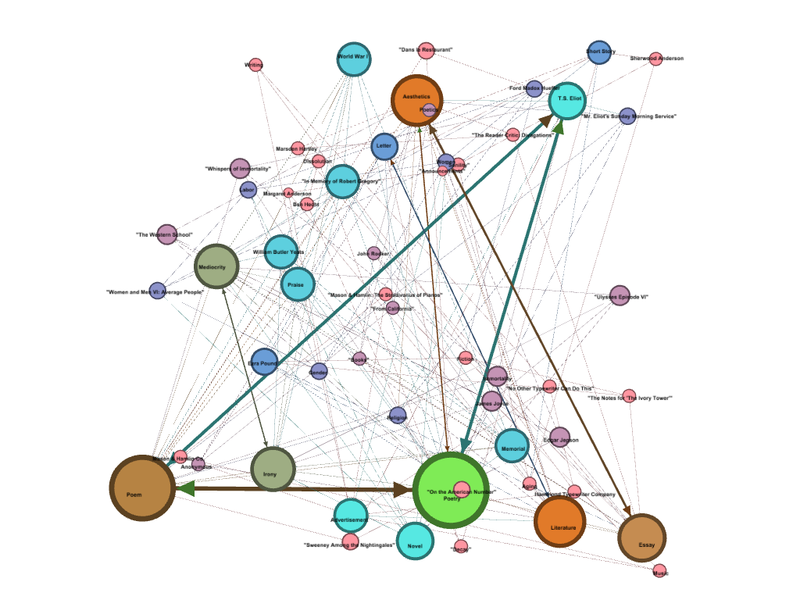 It is truly interesting to use Gephi to go into a work of literature and see how it is represented. "I just wanted to see what it could do." This is an important attitude to take. You began by noticing a pattern and then manipulating it to see how it affected the relationships of other items. The Poem node designates genre, while the Poetry node designates a topic. So titles of poems and their authors will connect with Poem. Critical essays about poetry will connect with Poetry. Perhaps there's an interesting confluence of authors who connect with both (or don't). That would be an interesting question to take up when looking at the whole MJP. How many poets also write poetry criticism? Who are they? Is there some interesting pattern pertaining to poets who do not publish criticism?